Anyone who has seen the show Deadliest Catchknows how dangerous crab fishing can be. Fishing for pollock, however, also has its dangers. Unfortunately, we found out the hard way. 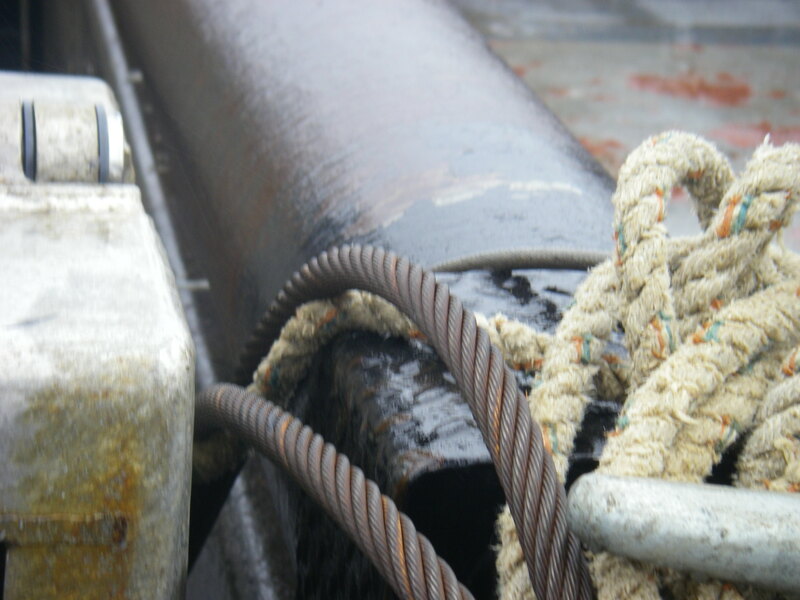 One of our deck hands caught his hand between a cable and the roller used to pull up the trawl net and hurt himself badly. The cable and the roller. Fortunately, the injuries are not life threatening and he will be fine. The injuries did require a hospital visit, and so we stopped at Sand Point to treat him. 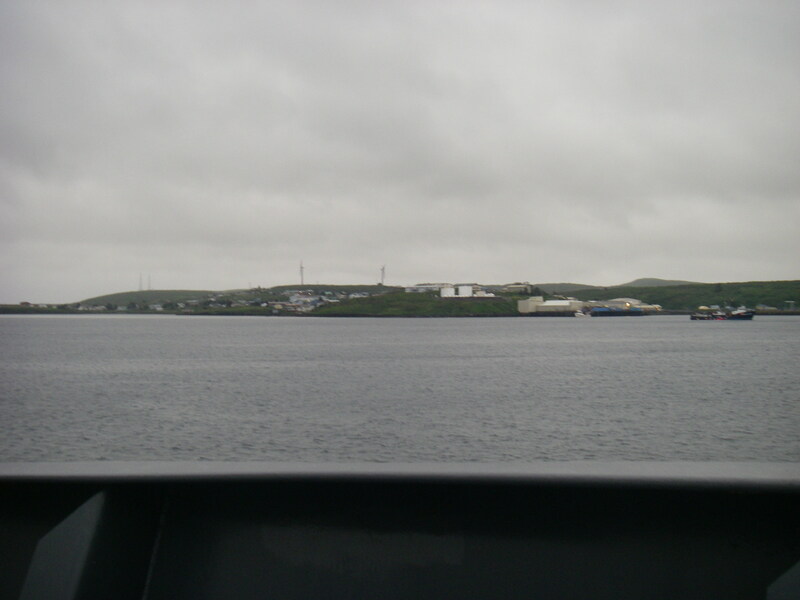 This is the town of Sand Point. 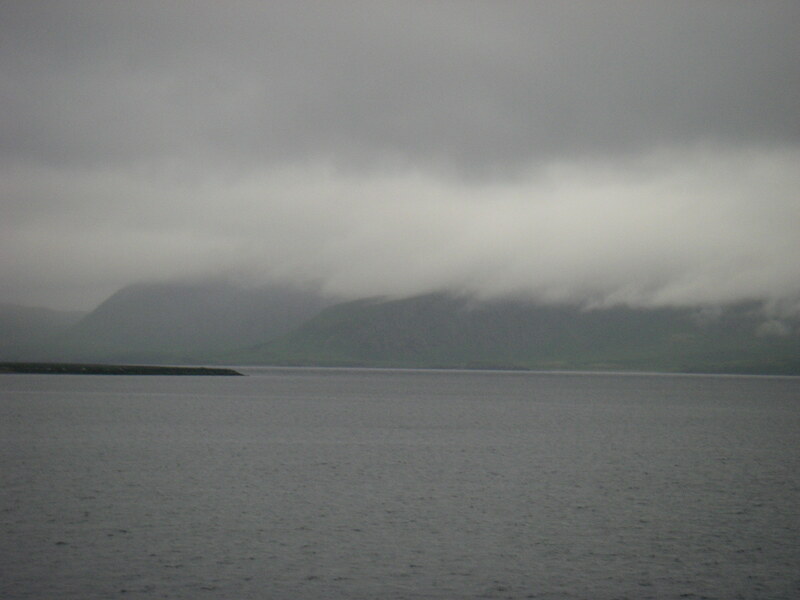 Clouds hang over the hills at Sand Point. The airstrip is in the left edge of the photo. We stayed at Sand Point for nearly 48 hours. What did we do? We fished, of course! We used long lines and hooks, and had a great time! Bill and Alex cast fishing lines in the harbor. We tied the lines off on the boat and hauled them up from time to time to check the bait. Alex with a flounder that he caught! 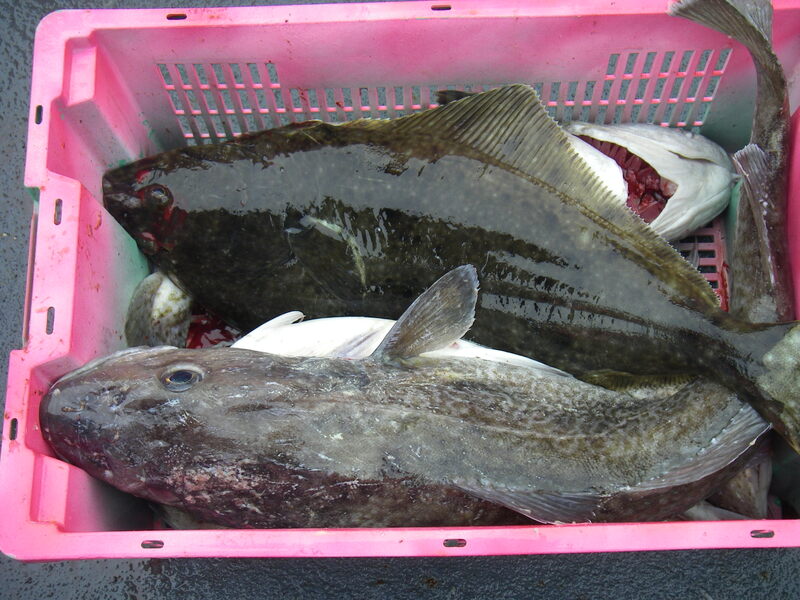 He also caught several cod and a 32-lb Pacific halibut! Cod and the flounder in a bucket! As with every fishing trip, we also managed to catch things that we didn't mean too! 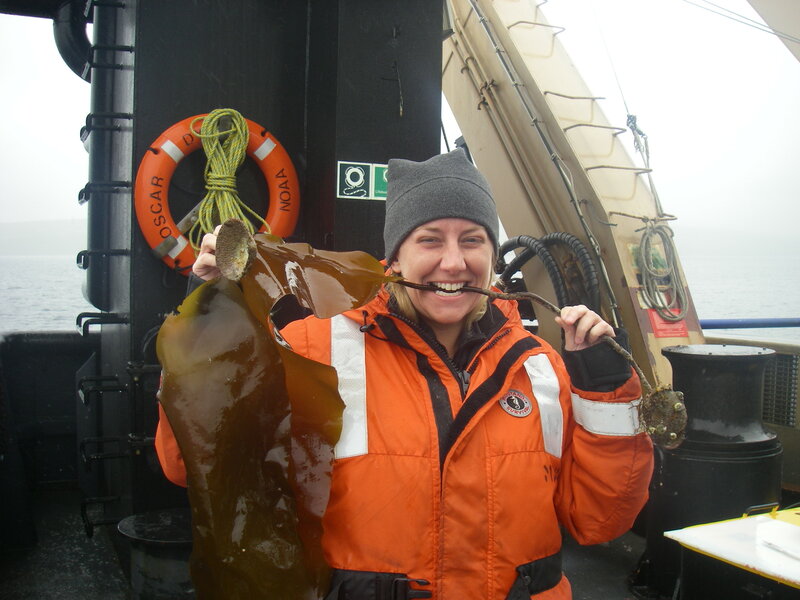 Tammy (the other NOAA Teacher at Sea) especially liked the kelp! A few visitors always hitched a ride on the kelp we caught. 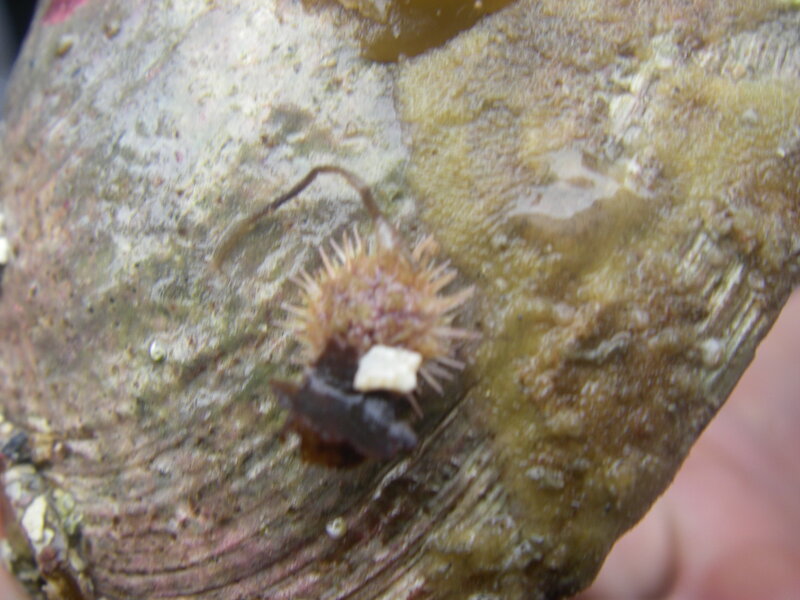 Here is a tiny sea urchin. 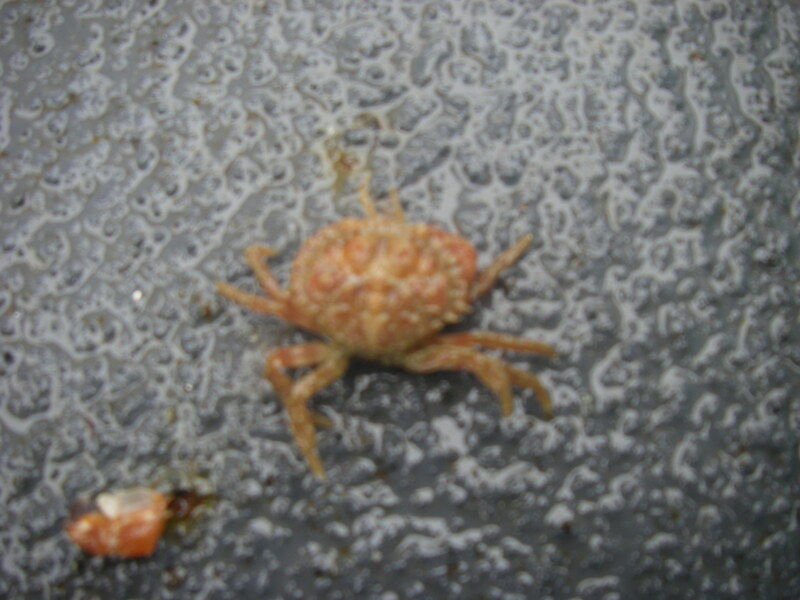 This crab was another hitchhiker on the kelp. We were bottom fishing for Halibut, and a starfish, the largest one I've ever seen, went after the bait! A one-day fishing license in Alaska costs $20.00. We had internet, so five of us went online and bought the fishing passes. Was it worth it? You bet it was! 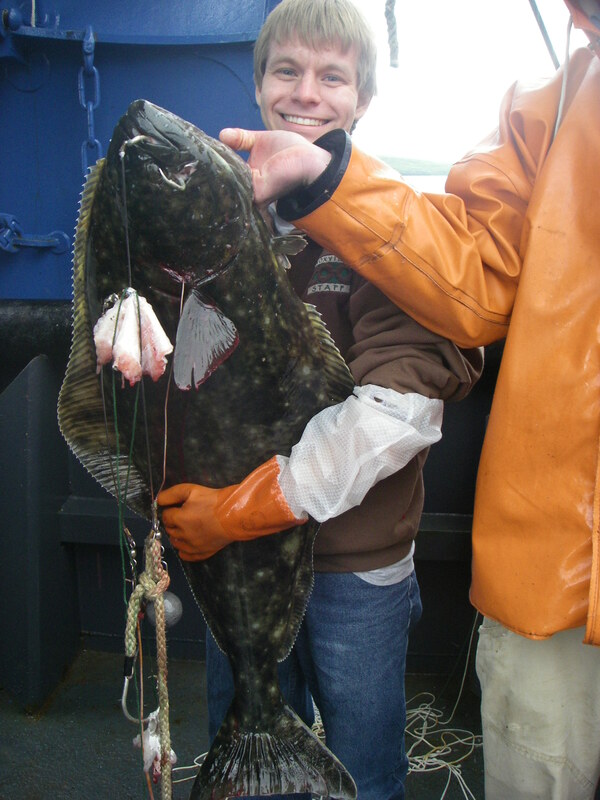 This is the 25-lb halibut I caught! It was AWESOME!!! We filleted it and had the cooks make it for dinner. With the halibut, we also cut out the fleshy “cheeks” and ate them as sushi right on the spot! It doesn’t get any fresher (or tastier!) than that! 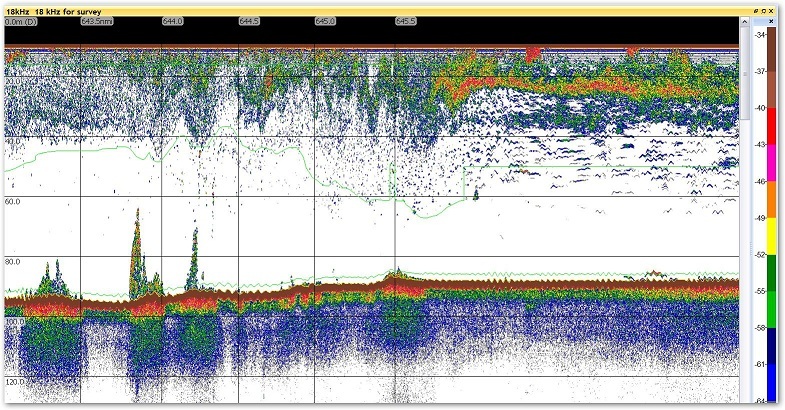 Today we will look at the acoustic system of the Oscar Dyson! Acoustics is the science that studies how waves (including vibrations & sound waves) move through solids, liquids, and gases. The Oscar Dyson uses its acoustic system to find the pollock that we process. The process begins when a piece of equipment called a transducer converts an electrical pulse into a sound wave. 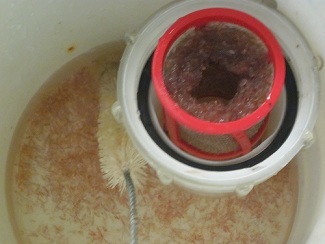 The transducers are located on the underside of the ship (in the water). The sound travels away from the vessel at roughly 1500 feet per minute, and continues to do so until the sound wave hits another object such as a bubble, plankton, a fish, or the bottom. When the sound wave hits an object, it reflects the sound wave, sending the sound wave back to the Oscar Dyson as an echo. 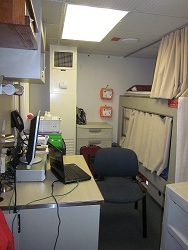 Equipment onboard listens to the echo. 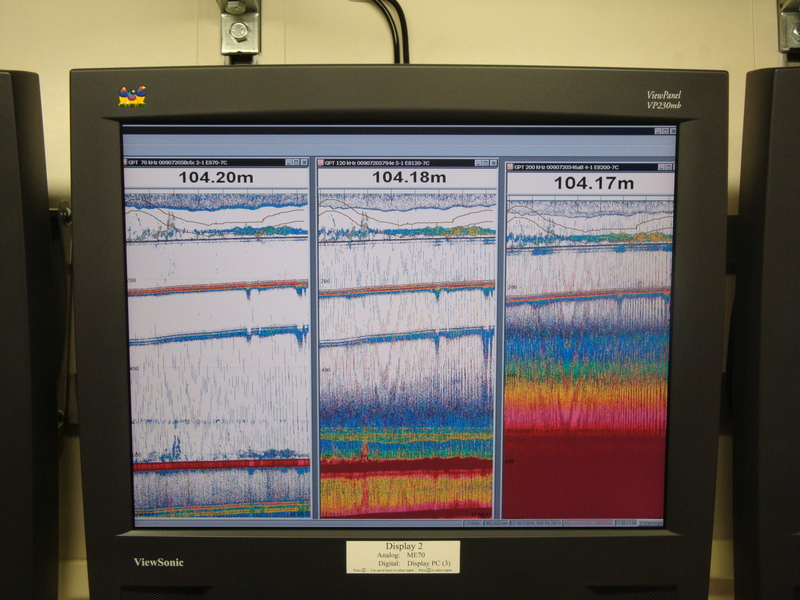 An image of the screen during a trawl. 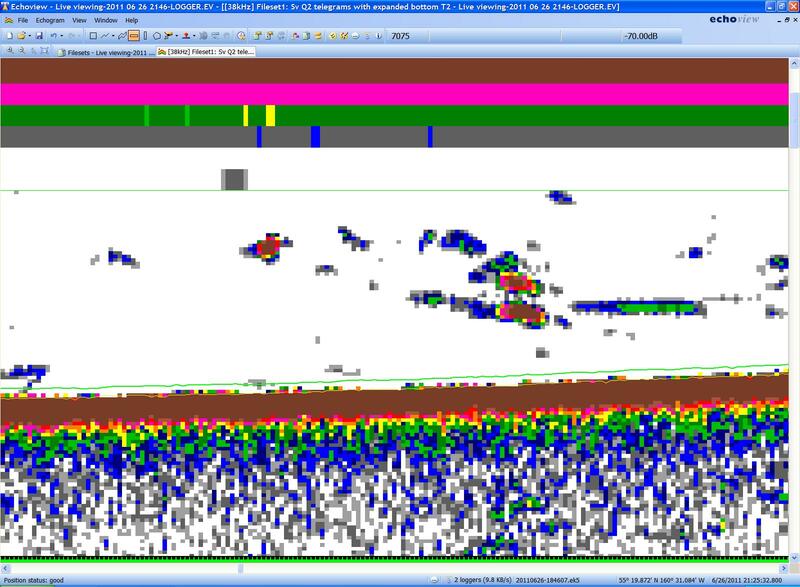 You can actually see the net--it is the two brown lines that are running from left to right towards the top of the screen. 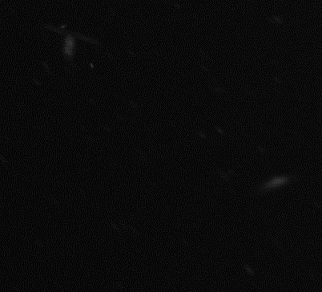 One of the things that surprised me the most was that fish and bubbles often look similar enough under water that it can fool the acoustics team into thinking that the bubbles are actually fish. 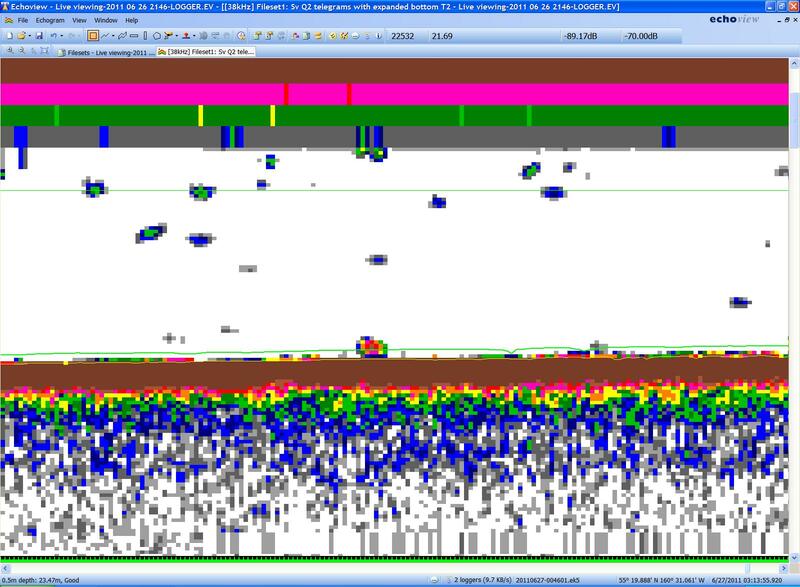 This is because many species of fish have gas pockets inside of them, and so the readout looks very similar. The gas pockets are technically called “swim bladders” and they are used to help the fish control buoyancy in the water. 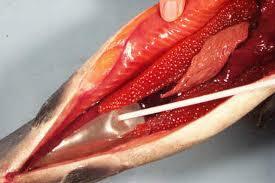 Swim bladder of a fish. Today’s questions come from Kevin Hils, the Director of Chehaw Wild Animal Park in Chehaw, Georgia! Q. Where does the ship name come from? 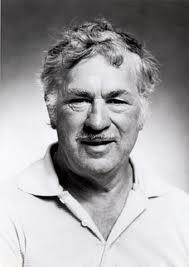 A. Oscar Dyson was an Alaska fisheries industry leader from Kodiak, Alaska. He is best known for pioneering research and development of Alaska’s groundfish, shrimp, and crab industry. Dyson was a founding partner of All Alaskan Seafoods, which was the first company actually controlled by the fishermen who owned the vessel. 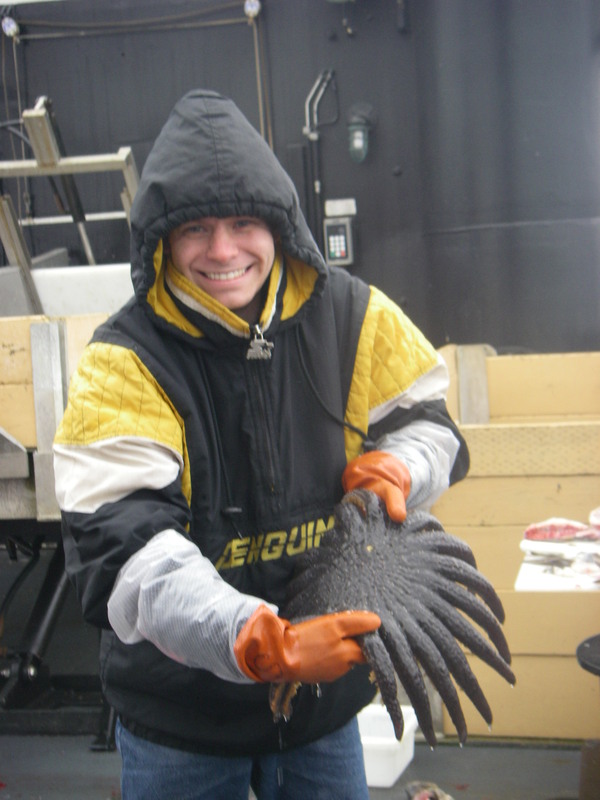 He also served on the North Pacific Fisheries Management council for nine years. He is in the United Fishermen of Alaska’s hall of fame for his work. 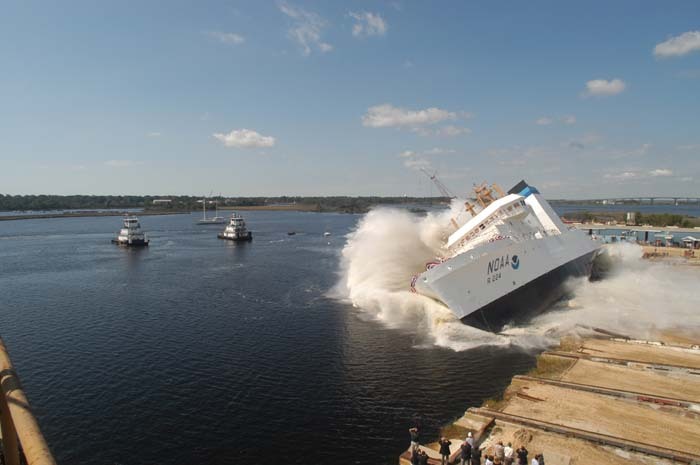 The ship was christened by his wife, Mrs. Peggy Dyson-Malson, and launched on October 17, 2003. Q. How do you see this helping you teach at Knoxville Zoo, not an aquarium? A. This will be a long answer. This experience will improve environmental education at the zoo in a variety of different ways. First, this will better allow me to teach the Oceanography portion of my homeschool class that comes to the zoo every Tuesday. 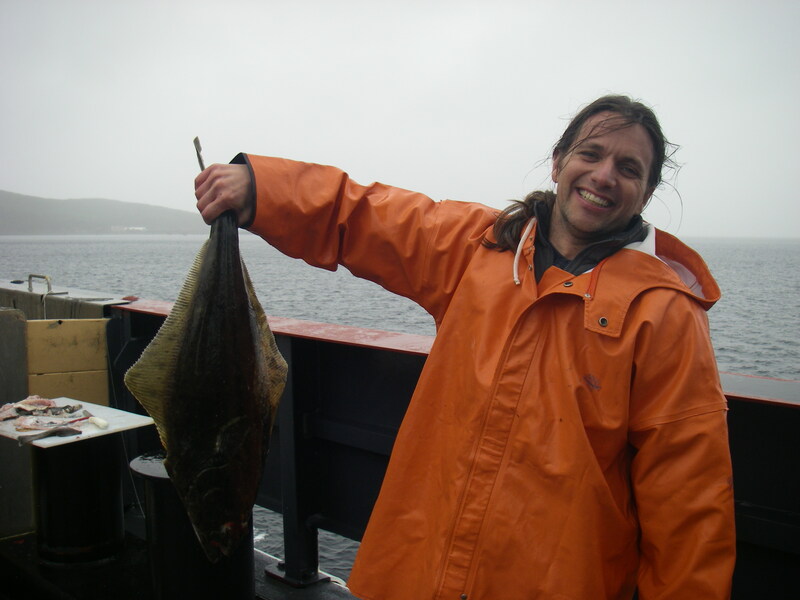 For example, I am in the process of creating a hands on fishing trip that will teach students about the research I have done aboard the Oscar Dyson and why that research is important. 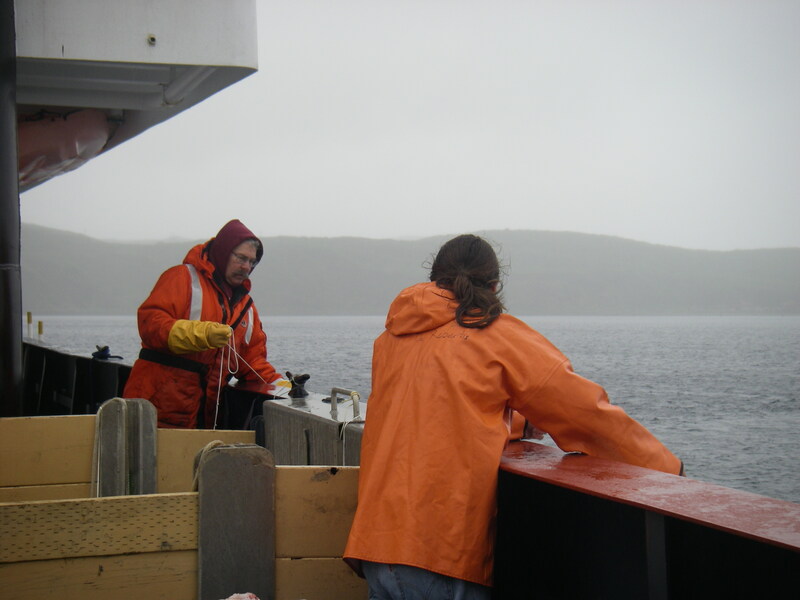 Homeschool students will not just benefit from this experience in Oceanography, but also in physics (when we look at sound and sonar) and other subjects as well from the technical aspects that I have learned during the course of the trip. Scouts are another group that will greatly benefit from this experience as well. The Girl Scout council wishes to see a greater emphasis in the future on having the girls do science and getting real world experiences. While the girls are still going to desire the animal knowledge that the zoo can bring, they will also expect to do the science as well as learn about it. My experience aboard the Dyson will allow me to create workshops that can mimic a real world animal research experience, as I can now explain and show how research is done in the field. The same can be said of the boy scouts. In addition, one of the most common badges that is taught to boy scout groups that come in is the fish and wildlife merit badge. In the past, the badge has primarily focused on the wildlife aspect of this topic. However, I now have the knowledge to write and teach a fisheries portion for that merit badge, as opposed to quickly covering it and moving on. This will enrich future scouts who visit the zoo for this program. A major focus for all scouts is the concept of Leave No Trace, where scouts are supposed to leave an area the way they found it. The fisheries research being done aboard the Dyson is focused toward that same goal in the ocean, where we are attempting to keep the pollock population as we found it, creating a sustainable fishery. The goal aboard the Dyson is similar to the goal in scouting. We need to be sustainable, we need to be environmentally friendly, and we need to leave no trace behind. School children on field trips will greatly benefit, especially students in the adaptations section. There are some bizarre adaptations that I never knew about! For example, sleeper sharks slow, deliberate movement coupled with their fin and body shape basically make them the stealth fighter of the fish world. They can catch fish twice as fast as they are! Lumpsuckers are neat critters too! This knowledge will enhance their experience at the zoo during field trip programs. Finally, I can pass the knowledge from this experience on to my coworkers. This will not only better the experience of my students, but it will also improve the outreach programs, the bedtime programs, the camps, and other programming done at the zoo. Q. Are you old enough to be on a ship? You look like you’re 13???!!!! A. SHHHHHHH!!!! You weren’t supposed to tell them my real age! They think I’m 24!